ADC, along with 33 other associations, including 17 state oil and gas trade associations, signed a letter to members of Congress on 28 November as part of the Intangible Drilling Costs (IDC) Coalition. The Coalition expressed concern that future tax reforms could seek to limit or eliminate the current deductibility of IDC’s. The tax code currently allows operators to deduct expenses such as labor, fuel, repairs, hauling and other non-salvageable expenses required for the drilling of oil and gas wells as they are incurred. The letter went on to detail ramifications of such reforms, noting restrictions on expensing IDC’s would discourage new US oil and natural gas exploration and undermine energy security in the US. Signees stressed new investment in American energy as critical to meeting future energy demand, boosting US energy security and protecting and creating jobs. The Coalition also pointed out the industry’s strong job creation numbers during the most recent recession, with more than 119,000 jobs created, as compared to other sectors, which lost more than 4.5 million jobs in the same time frame. It also noted the comparably high wages of those in the industry, noting that job creation and salary could be negatively impacted should modifications to IDC’s be enacted. While the Coalition acknowledged that the letter, addressed to Dave Camp (R-MI), Chairman of the Committee on Ways and Means, Sander M. Levin (D-MI), Ranking Member, Committee on Ways and Means, Max Baucus (D-MT), Chairman, Committee on Finance and Orrin G. Hatch (R-UT), Ranking Member, Committee on Finance, is only a first step in the process, it is nonetheless pleased with the support of so many critical groups, including IADC. For more information, please contact Brian Petty at +1/202-293-0670 (brian.petty@iadc. org). Banning BP from bidding in future offshore lease sales could have a hugely negative ripple effect on drilling contractors and the rest of the offshore industry as well as the Gulf region, and even the Federal government, according to a press release issued jointly between IADC and NOIA in late November. The offshore oil and gas industry, which is based almost entirely in the Gulf of Mexico, supported over 200,000 American jobs in 2010 and contributed nearly $80 billion in revenues to the Federal government from 2001-2010. BP is the largest operator in the Gulf of Mexico, and its investments in the region create business opportunities for many other companies, create and sustain good jobs in the region, and generate much needed government revenue. The timing of the EPA announcement was unfortunate, coming on the same day as the first offshore lease sale in the Administration’s new five year plan. Although BP submitted no bids, the Federal government profited by $133 million from this week’s Western Gulf lease sale. The next offshore lease sale, scheduled for March 2013 in the Central Gulf of Mexico, is expected to bring in a much bigger take for the Federal government. NOIA and IADC, both of which count BP as a member, feel that EPA’s suspension may be overly punitive, considering BP’s diligent efforts to work with the federal government on cleanup and restoration efforts, and given the further potential far reaching impacts of the action. “We are hopeful that the offshore industry, the Gulf region, and the Federal government can benefit from BP’s participation in the upcoming Central Gulf sale and future offshore lease sales,” said Brian Petty, IADC executive VP of government affairs. For more information, please contact Brian Petty at +1/202-293-0670 (brian.petty@ iadc.org). The UK’s Department of Energy and Climate Change (DECC) Secretary, Edward Davey, recently announced that exploratory hydraulic fracking for shale gas can resume in the UK, with the addition of newly instituted controls to mitigate the risks of seismic activity. In a press release issued by the DECC, Mr Davey said, “Shale gas represents a promising new potential energy resource for the UK. It could contribute significantly to our energy security, reducing our reliance on imported gas, as we move to a low carbon economy.” He went on to announce the creation of the Office of Unconventional Gas and Oil, which will be led by the DECC, and will focus on regulatory efforts. Exploratory fracking has been suspended in the country since 2011, when two seismic tremors were detected in an area where fracking operations were taking place. After a thorough investigation on the topic, the government concluded that the seismic risks associated with fracking can be managed with controls. These include a review to assess seismic risk before fracking begins; a plan, submitted to the DECC, that shows how seismic risks will be addressed; seismic monitoring before, during and after fracking; and a “traffic light” system that will alert operators to seismic activity and detail the appropriate response, along with a trigger mechanism that will stop operations in certain situations. For more information, please contact Brian Petty at +1/202-293-0670 (brian. petty@iadc.org). API recently issued a publication notice for API Standard 53, Blowout Prevention Equipment Systems for Drilling Wells, Fourth Edition. The standard provides requirements on the installation and testing of blowout prevention equipment systems on land and marine drilling rigs. The revised document includes recommendations made by the Joint Industry Equipment Task Force and other organizations following the Macondo incident. API sought the expertise of international oil and gas operators, manufacturers and contractors, and incorporated their recommendations into the latest revision. API 53 focuses on items specific to BOP equipment systems for drilling operations. The newly revised document is reorganized into sections that contain provisions for surface BOP systems, subsea BOP systems, and those that apply to both. The latest version omits diverters, shut-in devices and rotating head systems. For details, contact Alan Spackman at ext 207 (alan.spackman@ iadc.org. Stephen Colville, IADC president and CEO, presents the award to Precision Drilling’s Niels Espeland. 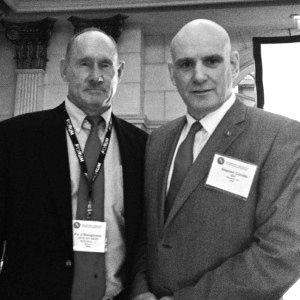 IADC recognized Niels Espeland and Pat O’Shaughnessy with Exemplary Service Awards recently at the 2012 IADC Critical Issues Middle East Conference and Exhibition in Dubai, 4 December. Mr Espeland is president, International Operations, for Precision Drilling. Throughout his more than 35-year career in the international oilfield service and rig contracting industry, Mr Espeland has managed onshore and offshore operations in Latin America, Europe, Russia, the Middle East, Africa and Asia Pacific. He joined Precision Drilling in 2011 and served on IADC’s Executive Committee from 2010 through 2012. United Gulf Energy Resource’s Pat O’Shaughnessy was recognized for his decades of leadership. The second IADC Exemplary Service Award recipient was Mr O’Shaughnessy, Advisor to the Chairman at United Gulf Energy Resources. Mr O’Shaughnessy began his career in 1965 on drilling rigs in West Australia, and spent the next 27 years managing offshore and onshore operations in various international locations. In 1992, he joined National Drilling and Services Company in Oman as group general manager, before becoming advisor to the chairman for United Gulf Energy Resources. He was recognized for his longime IADC leadership, having previously served as vice chairman of Oman for the Southern Arabia Peninsular Chapter and program committee member on the Critical Issues Middle East Conferences and Well Control Middle East Conferences. The Petroleum Safety Authority of Norway (PSA) held a meeting on 30 November with more than 100 shipowners, drilling contractors and drilling service contractors to discuss the findings of a PSA-initiated study on the risk potential of well-control incidents. The study summarized four key challenges to reducing well-control incidents. The necessity of earlier detection of well-control incidents; increased attention to planning, barrier management and risk analysis; increased focus on major accident risk and investigation of incidents; and the necessity of creating a framework for good collaboration between operators and suppliers were emphasized. Attendees reviewed the study findings and discussed the challenges they encounter in their interface with operating companies. They concluded that a joint arena where drilling and well service contractors can exchange ideas and experiences is needed in order to reduce the number of well control incidences on the Norwegian shelf. Over the course of the next year, representatives from the Norwegian Shipowners Association will be taking the lead on establishing the proposed joint arena. For details, contact Alan Spackman at ext 207 (alan.spackman@ iadc.org). IADC, along with the Offshore Marine Service Association (OMSA), issued a joint letter on 28 November to Rear Admiral Ray A. Nash, Commander of the Eighth Coast Guard District regarding the new interpretation and application of 46 USC 8701. The law governs documents required by merchant mariners. An initial appeal issued on 15 August, 2012, was denied by the Commandant. The latest appeal again noted that the new application of the law, unchanged since 1983, appears to violate the requirements of the Administrative Procedures Act, and requested the Commandant reconsider his previous denial. IADC and OMSA asked to participate in a meeting at Coast Guard Headquarters to discuss the possible severe consequences of the reinterpretation. Further, it was requested that the current stay of enforcement of this new application of 46 US 8701 remain in effect until final agency action occurs. For details, contact Alan Spackman at ext 207 (alan.spackman@iadc.org). The International Standards Task Force of the OGP Wells Expert Committee recently issued OGP 485. A reference list of commonly used documents issued by OGP and other organizations, including IADC, it addresses standards and guidelines for drilling, well construction and well operations. The list is categorized by engineering design, systems and equipment related documents, management related documents and documents in development. It also includes documents currently under revision. OGP 485 will be updated and revised on a regular basis. For details, contact Steve Kropla at ext 211 (steve.kropla@iadc.org). 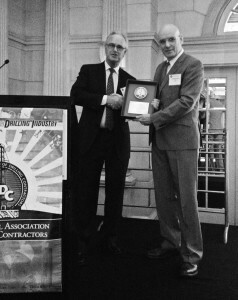 Brian C. Parks and Mike Killalea accept the 2012 Lantern Award on behalf of IADC and Drilling Contractor Magazine. 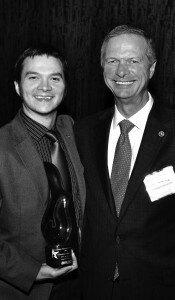 The Business Marketing Association of Houston awarded IADC the 2012 Lantern Award for Best Original Photography on 29 November. Brian C. Parks, IADC creative director and Mike Killalea, IADC group vice president/publisher, accepted the award, the BMA’s top honor, on behalf of IADC and Drilling Contractor magazine. The award-winning photo, titled “Shine on, Winter Sun”, was taken by Mr Parks on the North Slope of Alaska and was previously used as the cover image for the 2012 Media Kit for Drilling Contractor Magazine and in various editorial pieces. IADC was previously honored with a Lantern Award in 2007 for Best Magazine and has received multiple Awards of Excellence for editorial and design in the last several years. Alert 12-31: High potential- dropped pony collar. Alert 12-32: Inattentiveness results in injured employee. 2013 IADC Health, Safety, Environment & Training Conference & Exhibition, 5-6 February, Houston.